(CNN) -- Pluto may no longer be a planet, but it has a new claim to fame: "Plutoed" has been chosen 2006 Word of the Year by the American Dialect Society. The society defined "to pluto" as "to demote or devalue someone or something, as happened to the former planet Pluto when the General Assembly of the International Astronomical Union decided Pluto no longer met its definition of a planet." The former planet had some tough competition in the voting, which took place Friday at the ADS' annual meeting, held in Anaheim, California. The runner-up was "macaca" or "macaca moment," defined as "treating an American citizen as an alien" -- a reference to a campaign remark by former Virginia Sen. George Allen that some say marked the beginning of the end for his reelection hopes. Also in the running for Word of the Year were YouTube; surge (referring to a large, but brief, increase in troop strength); and flog ("a fake blog created by a corporation to promote a product or a television show"). Like any good awards show, the ADS meeting had multiple categories. In the "Most Unnecessary" category, "SuriKat" (the supposed nickname of the baby girl of Tom Cruise and Katie Holmes) beat out "the decider," President Bush's description in April of his position in relation to whether Donald Rumsfeld kept his job as secretary of defense. The "Most Outrageous" award went to "Cambodian accessory," defined as "Angelina Jolie's adopted child who is Cambodian." In the "Most Euphemistic" category, the winner was "waterboarding," defined as "an interrogation technique in which the subject is immobilized and doused with water to simulate drowning." Winning words or phrases don't have to be brand new; what's important is that they gained new prominence in the past year. The society is dedicated to the study of the English language in North America, and includes academics, writers, and others. For many people, this time of year brings 'March Madness,' the frenzy of tournaments to determine the best college basketball team in the nation, but for thousands of high school students around the world, the 'madness' involves robots. The robots are in their shipping crates en route to their local regionals. It's probably the first time in six weeks that teams have had a chance for a breather, but is it just the calm before the storm? Image left: Members of the Space Cookies, Team 1868, share their experience as a joint NASA Ames/Girl Scouts FIRST Robotics team to NASA Deputy Administrator Shana Dale. Image courtesy: NASA. Was it enough? Will the robot hold together during competition? Will the robot do what we want it to? How will it stack up against the competition? Starting on March 1, the battle to determine the best robots begins with FIRST Regional competitions in New Hampshire, Virginia, New Jersey, Oregon and Missouri and continues through March with 32 additional regionals comprising more than 1000 teams. The best from these 37 regionals will be invited to the Georgia Dome in Atlanta to compete for the FIRST championship April 12-14. How do teams get to be the best? This year, the game 'Rack and Roll' mixes engineering skills and strategy with a little fast-thinking math. To score points, robots place different colored inner tubes on a multi- tiered rack system placed in the center of the playing field. After the first tube is placed on a rack, points are multiplied for each successive tube, allowing for an exponential growth in points. The winning team will be the one that best implements its strategy while blocking its opponents. 'Rack and Roll' promises to be a fast-paced, high-scoring battle for robotic supremacy. Once again, NASA is helping contribute to the 'madness.' Through the NASA Robotics Alliance Project, located in California's Silicon Valley, NASA Headquarters and the 10 NASA field centers are sponsoring more than 200 teams and the regional competitions in New Orleans, San Diego, Milwaukee, Las Vegas and Lafayette, Ind. NASA personnel also volunteer their time and expertise as team mentors. Image right: On the spot engineering during the 2006 FIRST Robotics Championship Tournament in Atlanta. Image courtesy: FIRST Robotics. Follow the excitement of the other 'March Madness' at the NASA Robotics Alliance Project website and the FIRST Robotics website. Check for webcast and NASA TV opportunities to watch your favorite teams. Solar sails, as they're called, hold great promise for providing propulsion in space without the need for heavy propellant. But building a solar sail will be hard; to make the most of sunlight's tiny push, the sail must be as large as several football fields, yet weigh next to nothing. Creating a super-lightweight material for the sail itself is tricky enough, but how do you build a “mast” for that sail that's equally light and strong? SAILMAST will fly aboard NASA's Space Technology 8 (ST8) mission, scheduled to launch in February 2009. The mission is part of NASA’s New Millennium Program, which flight tests cutting-edge technologies so that they can be used reliably for future space exploration. While actually flying to nearby stars is probably decades away, solar sails may come in handy close to home. Engineers are eyeing this technology for “solar sentinels,” spacecraft that orbit the Sun to provide early warning of solar flares. The key question is how straight SAILMAST will be after it deploys in space. The smaller the curve of the mast the more load it can support. “That's really why we need to fly it in space, to see how straight it is when it's floating weightlessly,” McEachen says. Find out more about SAILMAST at nmp.nasa.gov/st8. Kids can visit spaceplace.nasa.gov/en/kids/st8/sailmast to see how SAILMAST is like a Slinky® toy in space. Surely one of the most spectacular sights the solar system has to offer, Saturn sits enveloped by the full splendor of its stately rings. Taking in the rings in their entirety was the focus of this particular imaging sequence. Therefore, the camera exposure times were just right to capture the dark side of its rings, but longer than that required to properly expose the globe of sunlit Saturn. Consequently, the sunlit half of the planet is overexposed. 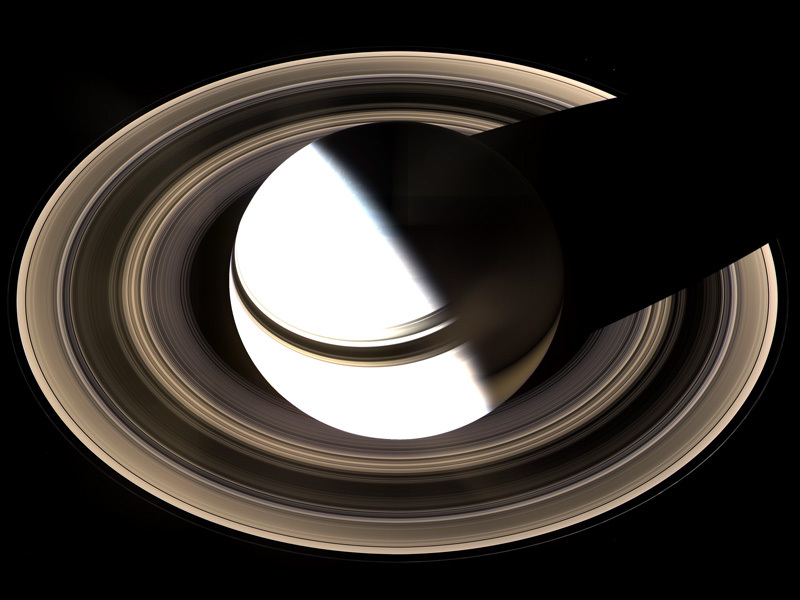 Saturn's shadow stretches completely across the rings in this view, taken on Jan. 19, 2007, in this mosaic composed of 36 images taken over the course of about 2.5 hours. Q1: Do you look upward at the night sky when you get a chance? Q2: Do you watch space shuttle launches on TV? Q3: Would you watch a space shuttle launch live if you could? Q4: Can you name 2 or more constellations? Q6: Do you wonder whether there is life on other planets? Q7: Have you ever argued with someone about whether we have actually landed on the moon? Q8: Do you know what Neil Armstrong said when he first stepped onto the surface if the moon? Q9: Did the debate over whether Pluto is a planet interest you? Q10: BONUS—Are you actually taking this quiz? Tally up your “yes” answers to gauge your level of space-related nerdity and compare with your friends! Thursday March 8 - 7:30pm, Monthly Club meeting at the Reading Museum. Tonight's program will be presented by Elizabeth Warner from Goddard, Maryland, on “Observing and Photographing Satellites”. Everyone is invited. Friday March 16 - 7:00pm, Before Dusk Messier Marathon @ Flying Field in Penn Township. Rain date is Saturday March 17th. Tuesday March 20 - 8:00am, Judging for the Berks Science and Engineering Fair @ George Bollman Physical Education Center. Judging is being done for BCAAS by Mike Bashore. Wednesday March 21 - 7:30pm, Awards Ceremony for Berks County Science & Engineering Fair at the Albright Chapel. BCAAS Awards will be presented by BCAAS President, Dave Brown. Wednesday March 21 - 7:00pm, nuclear physicist Stanton Friedman will be giving a lecture entitled “Flying Saucers are Real”, in the Museum auditorium. For details, check the Museum website www.readingpublicmuseum.org for details. Thursday April 12 - 7:30pm, Monthly Club meeting at the Reading Museum. Tonight's program will be presented by BCAAS member and RACC's own Bruce Dietrich. Bruce's program is entitled "On the Edge". Everyone is invited.